Dunkirk was the first Battle that wasn't just something I saw in the newspapers. My uncle had been there and was wounded. They wouldn't let me visit him, because they knew I would bombard him with questions, but of course I thought it must be because his wounds were really terrible. Enemy planes now sometimes droned overhead and the ack-ack started up. The Battle of Britain was soon raging over Southern England and when we heard the planes we went out into the street to watch the dogfights. I read the papers and watched the newsreels avidly and dreamed of being a fighter pilot. I played 'crashes,' baling out at the last moment from my burning plane (the sofa) and rolling under the dining room table to die heroically for my country! But I hated the sound of the sirens and I did wish we had an air raid shelter. During the first raids, Mum and I went into the Anderson shelter next door. It was very crowded, but I loved being the only child among all those friendly grown-ups. I could identify most aircraft by their engine noise, so they asked me each time a plane approached if it was "ours" or "theirs." But Mum decided that we needed to sleep at night, raids or no raids. So for a few nights, we stayed in bed when the sirens went off. But the raiders came every evening and the raids lasted nearly all night. Dad was fed up with me constantly asking to go down to the shelter and got my old cot down from the loft. It was large and made of mahogany. He put it next to his and Mum's bed and told me that since I was behaving like a baby, I would have to sleep in it again. He put heavy planks across the top once I was inside and said it was my very own air raid shelter. I retorted that I thought sleeping under the billiard table downstairs would be safer and there would be room for him and Mum as well! He didn't think much of that idea, but he did get all the cushions from the lounge suite and put them on top of the planks. By now, Mum and I were on our own nearly every night, because if Dad wasn't on a late shift, he would be in the street fire watching. I had crawled out of my 'shelter' into the big bed with Mum one night when we heard something thump on the roof and roll down to the gutter. Dad was out in the street. He whipped a ladder up against the gutters, raced up the ladder with a bucket and coal shovel, scooped the incendiary bomb into the bucket, slid down the ladder and dumped the contents of a sandbag on it before it could set fire to anything! He told me afterwards always to use earth or sand on an incendiary bomb, because it could be an oil bomb, or even phosphorus, and water only made those fires worse. He said that they were very small bombs, containing little or no explosive. They were dropped by the hundreds in large outer casings which broke up on the way down and were called 'breadbaskets.' So whenever we heard them rattling on the roof, we laughed, and said it was only one of Hitler's breadbaskets. 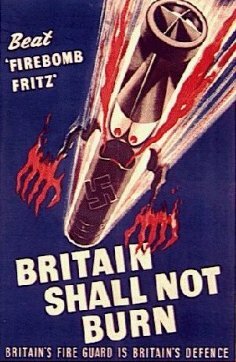 Dad must have had our street well trained, because Hitler didn't manage to start a single fire in it! But Mum moved their mattress downstairs to the chimney corner (supposed to be the strongest part of the house) and my cot was put close by, turned upside down now, the planks and cushions still on the 'top.' I crept in and out by raising the 'drop side' and slept on the floor. I still fancied the billiard table, but Dad finally managed to shut me up. He sold it to a mate because we needed the room now that we were sleeping downstairs and he couldn't get it up our narrow staircase! The raids seemed to go on forever and I lay under the cot night after night listening to the drone of planes, the barrages, the thump of falling shrapnel, and waited tensely for the big explosions when a plane came down or a bomb dropped nearby. By now, I was beginning to realize that our own defenses were as likely to kill or injure us as the enemy raiders. Dad took me one morning to see the wreckage of a Messcherschmitt which was brought down by our ack-ack. It had been put in the car park of a local cinema, but I knew it hadn't crashed there, because there was no damage to the walls or roadway. So I asked Dad to show me where it had come down, but he wouldn't. One evening, (I was in my 'shelter' supposed to be asleep ) Dad came home for his break, something he didn't normally do. He was white and shaking, and I heard him tell Mum, "I was standing by our bin at the Broadway in me tin hat, but I thought the ack-ack was getting a bit fierce. So I nipped into the bin and shut the lid. When the barrage stopped, and I climbed out, there was a bloke lying by the bin - the shrapnel sliced right through his bloomin' neck and took his head right off!" Poor Dad! But he had waited until his break to come home for a hot cup of tea and a hug from Mum and then he went back on duty. Another time, he was out nearly all night. That time I learned about the dreadful incident at Balham Underground Station. (Like many disasters, it was hushed up for fear of undermining public morale. So the photos weren't published till after the war.) A bomb had fallen near the Station, a bus fell into the crater, the tram lines were destroyed, and broken water mains and sewage pipes flooded the Station, drowning many of those who had sought safety there. Dad had to keep the other buses and trams running as far as possible on time! That meant getting buses re-routed and tram shuttles organized on the sections of track that still had electricity. The situation was worsened by the damage to the Tube Station which doubled the numbers of tram and bus passengers until the Tube was running again. It's little wonder, looking back, that he suddenly stopped being such an indulgent father and wonderful companion. But I didn't understand. I was frightened now because my Dad had become silent and surly. Mum had also become tight-lipped and irritable. She threatened me with all sorts if I upset Dad, and what upset him most was me showing any sign of fear. So I learned to keep quiet and pretend that I was fine. Even when the bombing came closer to our suburb and the noise never seemed to stop, I stayed quietly in my 'shelter,' more frightened now of upsetting Mum and Dad than of being killed or injured. I'll never forget being woken on Christmas Eve 1940, by a succession of whistling bombs to see that Father Christmas had somehow made it through the Blitz! Hanging inside my 'shelter' was a lumpy stocking, just like one of Gran's, and sticking out of the top was a little black baby doll in a smart green knitted romper suit and hat. Mum had bought the first volume of The Story of the War in Pictures for Dad, but he was working, so I grabbed it and spent most of Christmas day reading it and looking at the maps and pictures. That night, for the first time in months there was no raid. But they didn't half make up for it on Boxing Night!